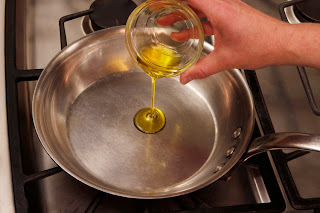 June 15, 2011, 1:55 p.m.
Pour some more of that EVOO on your plate -- a study finds that eating more olive oil could be linked with lower stroke risk in older people. Olive oil is a component of the Mediterranean diet, which is rich in healthy fats (like olive oil and nuts), plus whole grains, fruits, vegetables, fish and chicken. Red meat and wine are consumed in moderate amounts, and regular physical activity is part of the regimen as well. Other studies have linked the Mediterranean diet with a lower risk of heart disease, but scientists are still assessing the roles various portions of the diet and lifestyle play. In this study, participants were surveyed about how much olive oil they consumed: About 23% used none, 40% were moderate users (cooking with it or using it as a dressing or with bread) and about 37% were intensive users (using it in cooking and as a dressing or with bread). In an average 5.25 years of follow-up, 148 strokes occurred. Those who were intensive users had a 41% lower stroke risk compared to those who never used olive oil. Researchers arrived at that number after adjusting for such factors as body mass index, other stroke risk factors, diet and physical activity. The results were statistically significant for ischemic stroke (caused by blockage of an artery to the brain) but not hemorrahagic stroke (caused by the rupture of a blood vessel). The authors noted that the findings could be used to make dietary recommendations for older people at risk for stroke. The study was published online Wednesday in the journal Neurology.